Ulva, Lugger, 5 tons. Mr. T. Foster Knowles. Was born in Liverpool in 1869, and educated at Eton and New College, Oxford. 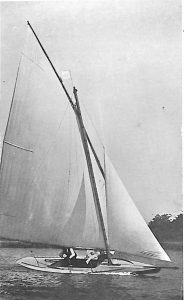 He started racing in 1889 with the Lapwing, of the Clyde 17-foot class. He subsequently owned the Fenella in 1894, Freya in 1895-6, and Fenella in 1897-8. He owned the Ulva in 1902, and now owns the Lapwing, 3 tons. He is a member of the Council of the Yacht Racing Association. Clubs: Royal Northern, Royal Clyde, Royal Largs, Royal Western of Scotland, Gourock, Royal Mersey, Clyde Corinthian.